The Cadillac ATS-V at the Los Angeles auto show in Nov. 2014. Canadian sales are down 6.3 per cent in 2018. DETROIT -- General Motors will discontinue the Cadillac ATS sedan after the 2018 model year, just six years after introducing the small car as a worthy rival to the strongest German competitors. A Cadillac spokesman said the luxury brand plans to replace the compact ATS, midsize CTS and large XTS sedans with two new sedans, though it's unclear when the new models will be launched. Beginning with the all-new XT4 compact crossover that goes on sale this fall, Cadillac says it plans to launch a new model every six months through the end of 2021. The Cadillac XT6, a new three-row crossover, is expected to be the next Cadillac launched after the XT4. 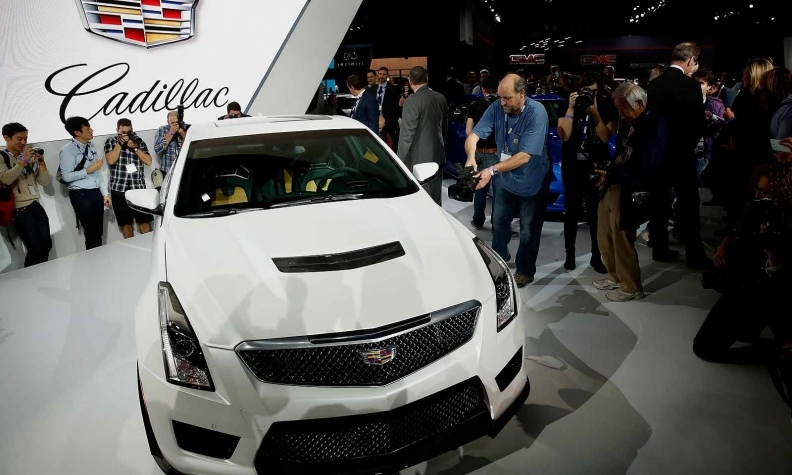 The ATS, Cadillac's smallest sedan, was introduced in 2012 and is assembled in Lansing, Mich. Cadillac will continue to market the ATS coupe for the 2019 model year, a spokesman said. At the time of its unveiling at the 2012 Detroit auto show, Cadillac touted the ATS as an equal competitor to the best of Germany’s small cars, such as the BMW 3 series, Audi A4 and Mercedes C class. Mark Reuss, GM’s current product development chief who was then North America president, said the ATS represented "the new soul of Cadillac" and was developed "to meet or beat the absolute best compact luxury cars in every measure." It was Cadillac’s first small car since the Cimarron, an infamous failure of the 1980s. "Production of the ATS sedan is ending due to extensive plant upgrades, expansion and re-tooling to prepare for the next generation of Cadillac sedans," Cadillac spokesman Donny Nordlicht said Wednesday. "Cadillac's future sedan portfolio will consist of three sedans, positioned in different segments and clearly differentiated by size and price." The CT6 will remain Cadillac's flagship sedan and is playing the lead role as a new technology platform for Cadillac, beginning with the introduction of Super Cruise semiautonomous technology on the 2018 CT6. The ATS is the most popular Cadillac car in Canada through the first four months of 2018, selling 669 but down 6.3 per cent compared with the same time last year. It accounted for nearly two thirds of Cadillac car sales through the first four months of this year. U.S. sales of the ATS sedan and coupe slumped 39 per cent in 2017 to 13,100 units. However, they have jumped 7.4 per cent this year. Overall, U.S. car sales are on track to fall for the fifth straight year in 2018 as more Americans migrate to crossovers, SUVs and pickups. Cadillac had been using the ATS as a volume play for dealers this year, highly incentivizing the cars because it did need to worry about their residual values.